The following is one of a series of informational guidelines designed to aid an artist in a specific area of illustration. These guides will contain both text and images. It is hoped that this information will allow the reader to expand their ability to render a subject more to their satisfaction. With that in mind, Let's begin! A Drape (or Hanging) fold tends to demonstrate a sweep of curves between its two points of support. As the points of support change, the curves change accordingly. A good way to get an idea of how this works is to take a piece of string about a foot long (or a simple chain necklace, which is ideal because of the way it will hang) and grasp it near the ends. Bring your hands together, pull them apart, change the level of either hand, raising one higher than the other. Note the way the bend of the string or chain is affected. The curve will turn roughly at the center when your hands are even. Otherwise, the bend will bias toward the lower support point and the curve turns more steeply from the lowest part of the turn on to the lower point. See the examples. 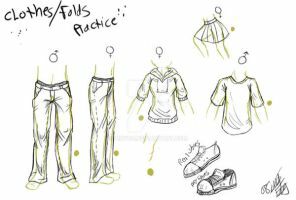 FOR PRACTICE: Drape folds are a little less common in your normal surroundings, but they do occur, usually as secondary curtain accents and as some embellishments on long dresses or other garments. Playing with the string or chain in the manner suggested above can help, or take an actual piece of material and work with it. I just read through all of these and I saved the photos to my computer because they are so useful! I love that you explained the folds in detail and taught how to draw the basic ideas in order to gain experience in drawing folds and build onto basic knowledge. Thank you for posting this!